I received this award from Fren over at Because It's Human Nature to Communicate where she wrote that my blog was "a very informative, flexible and a jovial blog, authored by a fellow UPian; a link from Chase Images; ‘bet you, you’ll be amused at the many choices and links you’re about to see because of his excellent blog presentation. :)"
Write a post bragging about it, including the name of the misguided soul who thinks you deserve such acclaim, and link back to said person so everyone knows he or she is real. Choose a minimum of 7 blogs that you find brilliant in content or design. Or improvise by including bloggers who have no idea who you are because you don’t have 7 friends. Show the 7 random victims’ names and links and leave a harassing comment informing them that they were prized with “Honest Weblog.” Well, there’s no prize, but they can keep the nifty icon. List at least ten honest things about yourself and make it interesting!! Then, pass it on! 1. Coffee Messiah - who was the inspiration behind my Coffee addiction post. He has captured an audience, not just of coffee addicts, but of so many others because of his really interesting posts. He was also recently recognized on Bloggers' Blogs of Note. 2. Coachblogger - who I am giving this award to in the hopes that it goes from a string of mommy bloggers (see explanation at the end of this post!) to a string of daddy bloggers. Haha! A lot of stories and movies have been told about single moms but not a lot about single dads. Here he blogs about the life of a single dad with 4 beautiful girls, and he's a high school football coach too! 3. The Wild Onion Cafe - I wandered into this blog through some links, and left a crazy little comment. Then I was very graciously welcomed by the bloggers that run it. For being a truly warm and welcome place for new(ly revived) bloggers like me, I am awarding them an Honest Scrap award. I suggest you give them a visit! 4. Atheista - a former Tabangao-er and 2008 winner of the Philippine Blog Awards. His posts are intelligent and reflective, and definitely worth a visit. 6. Magnifique_f8h - My high school batchmate and friend so has this very well maintained blog which I used to visit so often. I am trying to catch up and read up! She describes herself as: Coffee addict, procrastinates, loves a lot, hurts a lot, idealist. 7. The Brownian Motion of a Photoplankton - This is the blog of a colleague and friend who recently had his first baby with his wife. He is a smart, honest, passionate and wonderful writer. 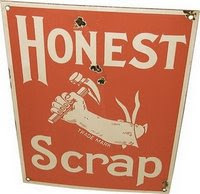 Perfect for the Honest Scrap award! 2. I truly, honestly believe that I was 11th place on the Mechanical Engineering Licensure Exams (but they only announce the Top 10)! Haha! 3. I always-always mistake "sinigang" (a kind of Filipino soup dish) and "sinangag" (one way to cook rice) even when I pause to think about which word to use. I also always mistake Bicol and Bohol (they both begin with "B"!). 4. I overanalyze everything. EVERYTHING. 5. I used to sing (understatement! more like do a concert...) in the shower all the time, but now I don't anymore. I just sing (and dance too sometimes) in my car while I drive. 6. I have tried to get six pack abs every year for 5 years now. But I still don't have six pack abs. 7. I was an achiever as a child and am still trying to return to my former glory. 8. Ironing also relaxes my brain, but going to a spa is way better. Haha. Aside from giving this award away, I wanted to trace back the origins of this award to as far back as I can starting of course with the one who gave me this award. It was quite amusing to find that I came upon this blog award after a long, looong line of Mommy Bloggers! Here goes! Born on a Syzygy > Because It's Human Nature to Communicate > kayni's corner cafe > witsandnuts > Intricate Thoughts > Niko's Blog > The Baby in Between > Pensive Thoughts > The Mommy Journey > Make or Break > The Breathing Post > Momma Young at Home > Misadventures in Baby Raising > Well Behaved Women Rarely Make History Janana Bee > Sometimes Lucid > La Mom > Under the Influence > Adlibby on the Loose... > Delightfully Inappropriate > PINKNIC > C'est What?? > shop girl's blog > Stuff I Think About > Mainly Mandy > A peek at Karen's World > Good things come to those who blog > stil more to come! One thing you do not know, perhaps 2, is, before BON, I had already told some people I was cutting back and perhaps not blogging anymore. Then Bam, here I am. I will find time to do this, but of course not the same way, 'cause I'm very contrary, although it may not seem obvious. Cheers! And Thanks for joining in on TT too. How many cups of joe did you have already?! But wait a minute! I see only 7 honest things listed about you. Where are the other 3? And how can you sing AND dance while driving? You are always so cheerful and upbeat. Thanks for the visit all! And for those I gave the award to, Congrats! you deserve it! whose blog’s content or design is, in the giver’s opinion, brilliant!